Shark and Barracuda flies basically take on two different baitfish profiles; either that of a needlefish, long and slender or that of a almond shaped baitfish slightly longer that it is wide. Both profiles work for barracuda where as the needlefish profile is not so effective for sharks. Pictured here is Lefty’s Shark/Cuda fly created by Lefty Kreh and an excellent example of the category. 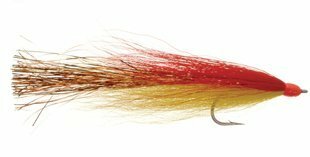 Color combinations of red and yellow are predominate for Shark flies where as chartreuse seems to be the color of choice for many barracuda patterns. Tandem hooks are often present especially in the long and slender needlefish patterns as is the use of synthetic materials and Flashabou/Krystal Flash. Hook sizes and styles vary greatly based on body design and length.